GAIA Diet Muesli - Does It Work For You? Muesli has been one of the most enjoyable cereal options. It is prepared from a mixture of cereals like corn, wheat flakes, oats and bran flakes. There are mueslis available with nuts and fruits as options as well. Manufacturers have christened it with the "diet" term by understanding the current trends in the health industry and have used it as a good marketing strategy. GAIA has also come up with diet breakfast muesli. The product has been advertized as a product low in fat, high in fiber and one with no cholesterol. It claims to be a healthier breakfast option for diabetics and weight watchers with no added sugar. It also says when this muesli is combined with skimmed milk and fresh fruits; it serves as a complete meal. Ingredients used in preparing these two forms of muesli are wheat flakes, iodized salt, soya lecithin, and malt extract, baking powder, rolled oats, apple juice concentrate, wheat germ and wheat bran. There is no difference in the ingredients used. For every 30g, only 0.51g of sugar is added in GAIA diet muesli as against 1.8g added in regular muesli. The amount of calories, protein, carbohydrate, fat and fiber are almost the same and will not make a huge difference in your daily intake. If the regular muesli is eaten by adding slim milk or slim yogurt, it matches the GAIA diet muesli in terms of proteins and health. 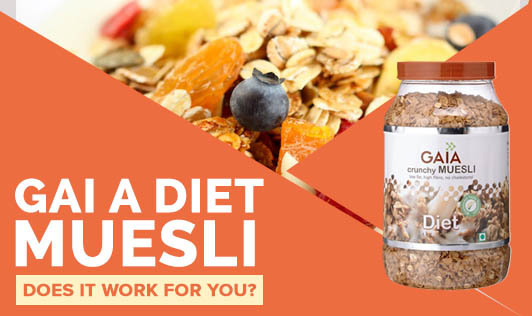 For those who are diet conscious, GAIA diet muesli can be an option. For diabetics, it can be a good option to break the routine from a diabetic diet due to its low sugar content. Keep a standard bowl for your cereal. Measure the amount of cereal you eat. Pouring from the box may give you more than one serving. Use slim milk, soy milk or slim curd and measure it before you add. Try to have a mix of different cereals. Do not repeat the same cereal every day. Eat bran flakes, wheat flakes, muesli, corn flakes etc. If possible, eat different fruits every day. Once a while, add brown sugar if you have sugar cravings. Do not buy sweetened or chocolate based cereals as they can be high in calories. Select your muesli the smart way!